SamuiBus.com | Book transfer from Pralarn Pier in just a few minutes! Pralarn Pier or Lomprayah pier is a ferry pier near Maenam Beach on Koh Samui. This is the pier where you leave and arrive if you travel with the Lomprayah High Speed Catamaran ferry between Koh Samui, Koh Phangan, Koh Tao and Chumphon. There are three daily ferries that leave the Pralarn-Pier. 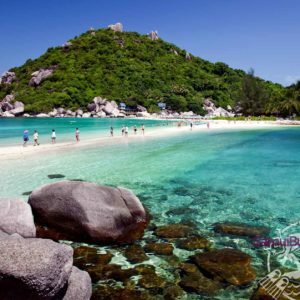 The first two at 08:00 and 12:30 offer a service from Koh Samui to Bangkok passing all the Islands in the Gulf of Thailand. Get from the Pralarn-Pier to the hotel and back will be so easy if you will think about it in advance. Just book Transfer service!